Since my last movie update, when I talked about the Independent Film Festival, I have seen a few movies. Not as many as my marathon summer last year, but the ones I have seen I have really enjoyed! The Five Year Engagement – In May I saw this film and it was good. I love Jason Segal and Emily Blunt and it was a fun movie, which wasn’t predictable. A plus, in my books! 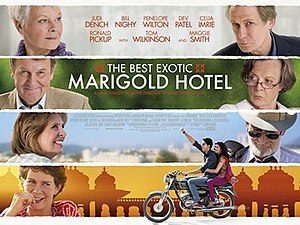 The Best Exotic Marigold Hotel – What a treat this was! We definitely skewed the age demographic a bit, as there were many people 60 and over, but it was so fun. It was a great audience with people talking back to the screen and making jokes, and the movie was a delight. Loved the sights! What to Expect When You’re Expecting – I wasn’t expecting this to be as good as it was! I thought it would be a predictable meaningless movie, but it was more than that. Worth seeing, even if you aren’t Expecting! It was funny and touching. Good stuff. Rock of Ages – And this was fun. Just silly fun. I know that I smiled throughout the whole thing, sometimes in disbelief at Tom Cruise’s character, and sometimes at the silly lines and predictability of the show, but it was a good time. People Like Us – I didn’t know what to expect with this one, but it was really good as well! A nice story; again, an unpredictable and well-told story. There were moments of discomfort, but the resolution was worth it. To Rome With Love – Woody Allen movie set in Rome. I was at the 10:00 PM showing, and that sometimes is a different audience. This time was no exception. There were three gentlemen who sat in the back and conversed with each other, loudly, in another language, throughout the entire show. I weighed whether or not I should say something and eventually decided to chalk it up to ambiance in the film-going experience. This movie had several story lines running through it and some I liked more than others. It was fun and beautiful. Moonrise Kingdom – What a fun movie this was! Silly and sweet and laugh-out-loud quirky. I really like Wes Anderson movies (The Royal Tennenbaums, Rushmore) and this one does not disappoint. It was really good. Magic Mike – Ah. With the girls, this was a lot of fun. It certainly didn’t live up to everyone’s expectations, as it turned out to be a pretty realistic and gritty view of the life of a male stripper, so the comedy was hard to find. But the scenery was great and the company was perfect. In theaters now I would like to see Brave, Safety Not Guaranteed and Take This Waltz. On DVD I hope to see Friends with Kids, and Salmon Fishing in Yemen. I just watched Jeff, Who Lives at Home and The Newlyweds, and really liked them both. I also have almost finished the NBC series “Smash.” I have the season finale to watch and I keep putting it off! That’s my May to Mid-July movie wrap up! What have you seen that you have loved this summer? This entry was posted in Movies! and tagged Arts, Best Exotic Marigold Hotel, Emily Blunt, Moonrise Kingdom, movies, Royal Tenenbaums, To Rome With Love, Wes Anderson. Bookmark the permalink.